After Paris attacks, French MPs approve motion to prolong strikes against ISIS, as PM Hollande tries to rally support in US, Germany. 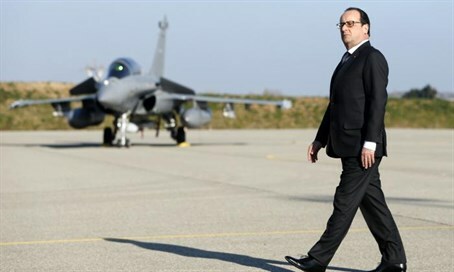 Hollande near French jet (file). French lawmakers voted overwhelmingly on Wednesday to extend air strikes against Islamic State (ISIS) targets in Syria, which have been stepped up following the Paris terror attacks. Paris has intensified its campaign against ISIS since the November 13 attacks that left 130 people murdered, this week launching its first strikes from the Charles de Gaulle aircraft carrier in the Mediterranean. The National Assembly approved a motion to prolong strikes by 515 votes to four, with 10 abstentions, as the defense minister said all 27 other European Union members had offered "direct or indirect" military support. Prime Minister Manuel Valls told lawmakers again that France was "at war" with ISIS. "There is no alternative: we must destroy Daesh," Valls said, using the Arabic name for ISIS. He said French planes, which started hitting ISIS targets in Iraq in September 2014, had carried out more than 300 strikes against the jihadists. President Francois Hollande met his US counterpart Barack Obama at the White House on Tuesday and German Chancellor Angela Merkel in Paris on Wednesday as part of a diplomatic push to forge a global coalition against ISIS. Hollande's efforts have so far produced only sketchy results - words of condolence from Obama but little in the way of firm commitments apart from an agreement to step up air strikes on the jihadists that US jets have already been carrying out for months. The French leader will be hoping for better results from his meeting with Merkel, his key EU ally. Earlier Defence Minister Jean-Yves Le Drian said EU nations had rallied behind France. "All 27 member states have agreed to support France - whether in the form of direct support in the Syrian theatre, indirect support to our operations in the Levant, or indirect support in other theatres where French forces are engaged," he said, without giving details of the support.